A typewriter, which its makers say is the last to be built-in the UK, has been produced at a north Wales factory. Manufacturer Brother, which says it has made 5.9 million typewriters since its factory in Wrexham opened in 1985, has donated the last machine to London’s Science Museum. The museum said the piece represented the end of a technology which had been “important to so many lives”. Edward Bryan, a worker at the factory since 1989, made the last typewriter. “If people ever ask me, I can always say now, as a strange question, that I’ve made the last typewriter in the UK,” he told BBC Breakfast’s Colin Paterson. He said he had previously “tried and succeeded to make one with my eyes closed”. The Brother said it had stopped making typewriters in the UK because demand had fallen sharply in this country. It said that it still had significant sales in the US but its factory in the Far East produces enough typewriters to serve this market. The company will continue to use the factory to run a recycling scheme for printer cartridges as well as to make other office technology. UK boss Phil Jones said the typewriter still held “a special place in the hearts” of members of the public. “Because of this, and the typewriter’s importance in the history of business communication, we felt that giving it a home at the Science Museum would be a fitting tribute,” he said. The Science Museum’s assistant curator of technologies and engineering, Rachel Boon, said staff were excited to add the item ” to our rich collection of typewriters ” which numbers more than 200. “This object represents the end of typewriter manufacture in the UK, a technology which has developed over the last 130 years and has been important to so many lives,” she said. The first known typewriter was invented in the US in 1830 by William Burt. 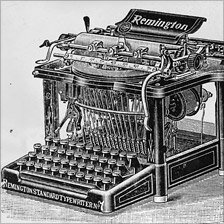 But typewriters did not become a commercial success until the 1870s when inventors Christopher Sholes – who also invented the Qwerty keyboard – and Carlos Glidden made a deal with the Remington company to mass produce their machines. The typewriter is widely regarded as being instrumental in helping many women to enter paid work for the first time. Typing classes became popular in the late 19th Century, and by 1901 there were 166,000 female clerks in Britain – up from 2,000 half a century before.